One of the most common household pests on Long Island are mice. Long Island is home to several different species of these tiny rodents, including the house mouse, white-footed mouse, and the meadow jumping mouse. Mice naturally gravitate towards homes and businesses as they are looking for both food and shelter. While these tiny critters can be cute to look at and are occasionally kept as pets, they can cause irreparable damage to your home and make you very ill in the process. Since mice are so small, they can get into almost any space. While this is ideal for them, this can be disastrous for you, your family, and your home. 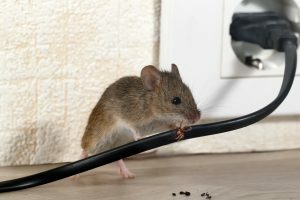 Mice can and will chew through almost anything, including wood, cardboard, insulation, metal pipes, plastic pipes, and electrical wires. This means that the plywood that constitutes your subfloor, the drywall that makes up your walls, and the wiring throughout your home are all highly vulnerable to mice infestation. Mice can transmit diseases that are fatal to humans. The hantavirus is carried by the deer mouse and white-footed mouse, both of which live on Long Island. A resident of Montauk died several years ago after contracting the virus. Damage from mice can go undetected for months or even years, until something catastrophic happens. Many people don’t know that they have mouse problems until they see droppings, which means the mice have already settled in. You can prevent further damage by calling Twin Forks Pest Control at the first sign of mouse infestation. Minor repairs for entry holes. Protect your family and your home or business by getting rid of these pests. Our mouse control specialists guarantee their work so you don’t have to worry. We operate east of Riverhead, so whether your home is in Southold or Eastport, we are available to get rid of your pests. Give the experts at Twin Forks Pest Control a call today at 631-287-9020 to schedule your free estimate.